In the twilight of the DS’ lifespan, you’d think we would only be seeing the best of the best come out. You know, top notch, quality stuff that deserves to be localized and published. As gamers, we should expect nothing less; these games are coming from developers who are trying to convince us to keep on using last generation technology, instead of moving on to brighter and newer things, which is what we collectively tend to do. However, publisher XSEED didn’t seem to get the memo. So instead, they decided to release CyberConnect2’s spiritual sequel to the cult classic PS1 RPG Tail Concerto and hoped for the best. The reasoning behind this is pretty sound, considering all that they had to do (and did) was license Nintendo of Europe’s English translation and simply change certain British English-isms to American English-isms before releasing it here. Its a process with a lot less work involved and much more hope for profiting sales. However, don’t think XSEED’s willingness to bring the game over means that Solatorobo is a good game. Because it isn’t. But before I get into that, I first want to congratulate CyberConnect2 for developing what is undoubtedly the best looking DS game ever made. If Solatorobo is good for anything, its for proving that yes, the DS can produce 3D graphics that won’t make your eyes bleed or give you bad flashbacks to the Playstation and Nintendo 64 era. 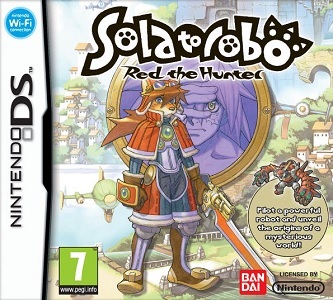 Far advanced from what Square Enix has shown us with their remakes of Final Fantasy III and IV, Solatorobo would look right at home on a Dreamcast. Surprisingly, this praise extends to the game’s 2D art as well, as it’s some of the sharpest I’ve ever seen on the system. Stills don’t do the game’s visuals justice. It’s much better when its the real thing. I honestly wish I could say that the rest of the game lives up to the high bar of quality set by the graphics, because for me, graphics are among the bottom rank of things I look for in a game when I’m trying to judge how good it is. Instead, I ask myself questions like: how’s the story? The combat? The music? Is the game logically and fundamentally sound? Does the game innovate? Does it have meaning? In all but two of these criteria, Solatorobo is an out and out disappointment. Let’s start with the story, which is easily the most banal experience I’ve had in a long time. It’s so straightforward and predictable, I don’t even think it would pass for a Saturday morning cartoon. It’s so simple and full of so many tired cliches that it makes the story of the Tales of games seem like Xenosaga or Metal Gear Solid by comparison. Far from being charming, the characters might as well not even have names they’re so archetypal, and any dramatic moment is shattered by the knowledge that everything’s going to turn out alright because the heroes never die and the villains always lose. Well, that’s what Solatorobo would have you believe, at least. The combat is similarly shallow and simplistic. Put simply, this is an action-RPG where the only option for combat is to throw things. 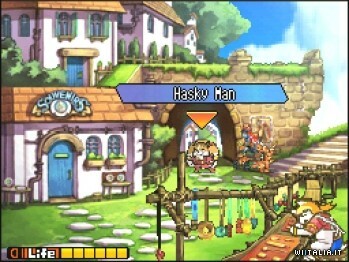 For the entire game, players will find themselves mashing the A button to pick up an enemy and toss it into the ground to damage it, or they will be launching projectiles back at different enemies to damage it. Sometimes, a little of both. But nothing beyond that. It seems like a fun, interesting idea at first, but everything I did in the first fifteen minutes of this game, I found myself doing at the end of the fifteen hours it took me to beat the story. Yes, the player acquires a small little bit of variety halfway through the game, but it just opens the amount of available attacks from four (aerials attacks count too!) to six, and to call that generous would be a massive understatement. The sound design for the game is best described as adequate. The music is inoffensive, but still repetitive and entirely forgettable. The sound effects are alright, but nothing to write home about either. The most interesting aspect here is the voice acting, which is in the original Japanese dub, but also contains traces of other languages, like (heavily accented) French and English, as well. Sadly, even though the chances are likely that you won’t understand them, you will definitely notice that they’re extremely repetitive and rather annoying to hear for the 200th time. I guess you could call the game logically and fundamentally sound. Nothing is really broken. But the problem is that the game is so easy that you’ll end up gliding through areas too fast to check for any way to screw yourself over. Aside from one death by being trapped in a corner by dumb enemy AI and some slowdown in large areas or when things get crazy on screen, the game runs just fine. I guess if I had to think of one complaint, it would be that I don’t think the game’s upgrade system is really that useful, but I guess it is a way to blow off some currency, so that’s a plus. And as for innovation and meaning, it pretty much lacks both. The most innovative feature I found was the way the game used the western style of obtaining Quests to further the story at every turn. Need to go talk to some guy to get access to a mine? Go take that quest he posted at the Quest Broker in order to talk to him! It’s such a fun idea, really. And then there’s the part where the game goes out of its way to abuse the story in order to teach the player how to play every minigame that the game has packed in. “Want to continue on with the story, Red?” It asks. “Well, first, you need to participate in this race! This fishing expedition! This other activity which includes a painfully obvious tutorial!” Any meaning of love and friendship that this game wants to portray is easily contradicted by how stupid it assumes the player is. I do hope you like horrible racing minigames. Oh wait, you don’t? Oops. Believe it or not, it’s been reported that Solatorobo has been in development for ten years (well eleven, considering localization time). And, of those ten, seven were spent on conceptualizing the game, building the world from different perspectives, and other flowery things like that that developers give as excuses when they mean to say “it just wasn’t greenlit yet”. Much like Duke Nukem Forever, Solatorobo further proves the fact that the time it takes to make a game is in no way related to its quality. If you were to ask me, the world is actually pretty shallow and devoid of depth, which is perfect considering that’s what Solatorobo is. Not something you’d spend ten years on. Instead, it seems like something the developers didn’t even spend one year on. The Good: The graphics are gorgeous, perfect for the Dreamcast, and um…seeing the credits for the second time (don’t ask) is a big relief! It also works, which is nice. The Bad: Shallow combat, shallow characters, a shallow and banal story… I don’t think even kids would enjoy a pool this small. The Ugly: Aside from the graphics, the finished product doesn’t represent in any way the significant amount of time taken to make it. Everything you need to know about the combat in one single image.